Enjoy a battery life of 4+ days and up to 10 hours when using GPS. The seamless watch case is water-resistant up to 50 metres. Stay connected with call, text and calendar notifications. Store and play 300+ songs. You can also access Pandora, no phone needed. Stay connected and reach your goals in style with a fitness tracker that doubles as a smartwatch. Use continuous heart rate and simplified heart rate zones to quickly gauge exercise intensity during workouts and better track calorie burn. Track activity like steps, distance, floors climbed, active minutes and calories burned, so you can see your stats and stay motivated all day, every day. Automatically track time in light, deep and REM sleep stages. Then, get personalized insights on habits to help you set goals. Use workout modes for real-time stats on screen or automatically track exercise with SmartTrack. Every move you make counts. To help you stay active throughout the day, the Fitbit Ionic sends Reminders to Move that encourage you to take 250 steps every hour. The Fitness App for Everyone. Use the app to see your exercise stats, their impact on your overall day, and how your performance is improving. Use sleep tools in the app to set a weekly sleep goal, create bedtime reminders and wake targets, and review your sleep trends over time. 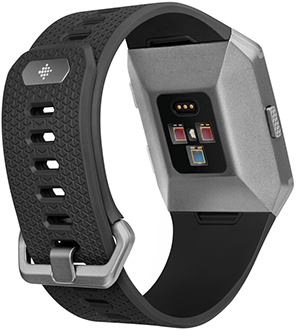 Fitbit works with most Apple or Android devices. Check device compatibility here. 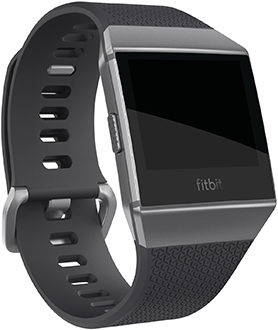 Fitbit uses very little data but pairs well with a TELUS phone plan. See your stats in a whole new way on the Fitbit app and dashboard. The watch that's designed for your life.